In general, same rules and formatting as with the previous three games. I like that the first and seconds ranks are more worthwhile than in Warriors of the North, even if you still reach the same total in the end. Nothing much to say I haven't said before, though. Rage cap +8. If playing the Orc: at the beginning of battle, gain 3% of your maximum Rage one time. Rage cap +16. If playing the Orc: at the beginning of battle, gain 6% of your maximum Rage one time. Rage cap +24. If playing the Orc: at the beginning of battle, gain 9% of your maximum Rage one time. A bit odd that Rage Control has lost its Adrenaline-related boosting (Also it's lost the Warriors of the North-exclusive Viking Attack boost, but that was honestly pretty bizarre and unwelcome), though I like that Bagyr gets a kind of low-grade Bloodlust bonus from it. It's a nice touch that helps cement Bagyr as the Rage specialist of Dark Side. Rage gain in combat +20%, and additionally +1 to Rage gained. Rage gain in combat +40%, and additional +2 to Rage gained. Rage gain in combat +60%, and additionally +3 to Rage gained. It's cheaper than in Warriors of the North and waaaay more accessible, which is fantastic. Not much to add beyond that. All player units receive +1 Initiative and +10% Attack on the first turn. All player units receive +2 Initiative and +20% Attack on the first turn, and less on later turns. All player units receive +3 Initiative and +30% Attack on the first turn, and less on later turns. I'm pretty sure Onslaught's 'rot' is one turn=one Skill rank. So if you have the second rank, you'll get the second rank's bonuses on turn 1 and the first rank bonus's one Turn 2. This is my favorite Onslaught in the series, between the 'rot' effect making the higher ranks much more worth considering and the fact that the Attack bonus much more encourages RUSH INTO BATTLE AND KILL 'EM ALL, which has always been the idea behind Onslaught but historically it's really been I WILL MAGE YOU TO DEATH SO HARD BEFORE YOU MOVE. (While my army stands on their hands) It's simple, straightforward, and a very clean fix. I'm not sure why it took three games and a switch to a completely different company developing it to happen. Skill tree requirements: Rage Control. A lot pricier than in Warriors of the North, and still hampered by Defense being one of the lowest priority stats, but it does provide more Defense than ever, so that's cool. Rest period on all Rage skills reduced by 1, to a minimum of 1. Action Rage is a weird Skill in Dark Side, being the only Skill in the entire game that is a little different for all three classes/characters. Also note that where in Warriors of the North it cost Might and Spirit Runes, here the Spirit Runes have been replaced by Magic Runes. Overall, this is a fairly big nerf compared to Warriors of the North, as leveling it just expands the list it effects, instead of increasing the reduction it does. This makes Dark Side second only to Armored Princess for restricting your ability to offset Rage Rest period increases, and in Armored Princess you generally didn't see a Rest period above 2-3, where in Dark Side Rest Periods can easily go up to 7 turns, so really this is the worst game in the series in real terms when it comes to Skill-based Rest reduction. It's also the only manner in which the concept of Rage moves being organized into class/character categories actually matter. Personally, I'd rather it had lowered just your class' associated Rage moves with increasing reduction as you leveled it, as that would've been a lot more consistently meaningful and helped set the classes apart that little bit more. Oh well, this isn't bad, it's just it could've been more interesting. Units have a 10% chance of purging one negative effect at the beginning of the round. Units have a 20% chance of purging one negative effect at the beginning of the round. Units have a 30% chance of purging one negative effect at the beginning of the round. Skill tree requirements: Onslaught and Resistance. It's Shield of Rage, but earlier in the tree and having swapped Magic Runes for Spirit Runes. Which means it's still a good Skill, even if its name remains baffling what with not actually interacting with Rage at all. It still also suffers from the odd quirk that if you're Plagueing your Undead the Skill can be an active disadvantage, which is even more of an issue than in Warriors of the North since you're encouraged to use Undead by Dark Side, unlike Warriors of the North, but at the same time Morale has been weakened per-tier so randomly losing the Morale boost from Plague isn't as hurtful as in Warriors of the North. So... whatever. If an allied unit gets a crit, it gains +1 Attack for the remainder of the battle. Maximum bonus of +10. If an allied unit gets a crit, it gains +2 Attack for the remainder of the battle. Maximum bonus of +20. If an allied unit gets a crit, it gains +3 Attack for the remainder of the battle. Maximum bonus of +30. Skill tree requirements: Onslaught and Action Rage. It's also worth noting for Bagyr in particular that one of his exclusive Skills allows him to get lots of crits very reliably if he's willing to throw units into the fray, and obviously this new version of Frenzy is quite synergistic with that effect. This is the best, most worthwhile Frenzy in the series is what I'm saying. Rage drains 10% slower out of battle, and Rage cannot be below 8% out of battle. Rage drains 20% slower out of battle, and Rage cannot be below 16% out of battle. Rage drains 30% slower out of battle, and Rage cannot be below 24% out of battle. Skill tree requirements: Resistance and Action Rage. It's Bloodlust, kinda, but earlier! And as with Bloodlust, the 'cannot be below' thing includes that if you end a battle below it your Rage will jolt up to that minimum next time the game ticks over the Rage/Mana process. So Rage Grasp is awesome and worth pursuing for anybody, even Daert if you can spare the Talent Runes. 5% chance for units to kill half the enemy stack when attacking. 10% chance for units to kill half the enemy stack when attacking. 15% chance for units to kill half the enemy stack when attacking. Skill tree requirements: Shield of Rage. Note that the game accounts for Leadership differential, like how it does for percentile damage from Burn, Poisoning, Freeze, and Bleeding. As such, you can't abuse this (too much) by spamming hordes of weak stacks via summoning spam, as eg a stack that is half the Leadership of the stack it's attacking will have a 2.5%/5%/7.5% chance of triggering Berserker, instead of the base chance. Note that splash damage attacks roll separately on Berserker for each hit, and that resistance isn't factored into a Berserker trigger. An Imp hurling a fireball into a clustered group of 5 Fire Immune units will still rip stacks in half if it triggers, and the weak splash damage will have a full chance of triggering too. As such, Berserker is particularly worth pursuing if you're already using/intending to use units with splash damage, or if you want to keep using a unit even in situations where its primary damage contribution is commonly ineffectual. (eg Scoffer Imps vs Demons, where the fireballs are broadly resisted, but prone to triggering Berserker hits) The overall result is that Berserker makes it easier for you to work around or ignore elemental effectiveness, which is actually a much more interesting effect than WotN's Berserker effect. It does have the disadvantage that it can't work on Gremlins, which was arguably one of the most useful situations for Berserker to trigger in Warriors of the North. The fact that its odds are scaled to Leadership also means that even though its odds are technically the same as the Warrior of the North version, realistically you can say it's consistently lower odds of activating. Still, it's a really neat idea, and it's too bad we didn't see a King's Bounty game try it until Dark Side, which as far as I can tell is very much a black sheep to most people. It doesn't even have its own forum sub-section in the 1c forums. Skill tree requirements: Rage Grasp. Bleh. It's the usual Rage experience generation Skill. At least non-Bagyr people can just ignore it, since it's not locking anything behind it, and for Bagyr it's not horribly burdensome to max. Might as well do so early, since you'll want all your Might Skills maxed eventually to max Chieftain, and you can bear the Rune burden in the long haul as well. Note that in Dark Side it's entirely realistic to cap Rage levels well before you've beaten the game without any ranks in Unity, at least if you're not playing Daert, further limiting its benefits. 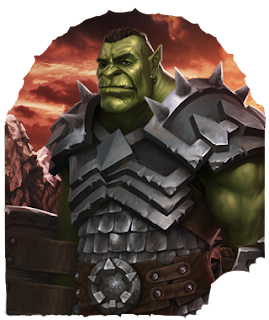 The following four skills are exclusive to Bagyr the Orc, and as always this space will double as a micro-analysis of the Might class. Bagyr is fun in a way that no prior Might class has managed. He's an incredibly effective user of Rage and his armies are surprisingly strong, enough so that Neoline's advantage in army size doesn't cleanly beat him out, and the overall result of his unique Skills is that he plays very differently from the other classes. In prior games the Might tended to be Mind/Spirit class but worse, albeit the details varied a bit. In Dark Side, the Might class is actually really strong, with the only low point being at the very beginning of the game before you've gotten Rage and where your lack of offensive Spells being built-in really stands out. Mind, it's quite the low point, with Bagyr being the only one of the characters who can struggle to reach the point Rage is acquired if you're playing on higher difficulties. For the other characters, so long as you're not making huge mistakes the worst you'll have to do even on Impossible is accept missing out on some opportunities to advance Grand Strategian. Once you do have Rage, Bagyr starts really coming into his own, thanks in no small part to Anger being available without any Skill requirements, just like The Legend. In conjunction with Rage Control giving him free Rage at the start of a battle, Bagyr is much more able to get Necro Pack off on the first turn before any enemies move and the like toward the beginning of the game, which can actually make him more effective than Neoline or Daert at getting clean wins! Bagyr does have a lull where you're waiting on unlocking his unique Skills. This applies to all the classes to some extent or another, but for Bagyr it's particularly pronounced, as generic Might Skills aren't very strong at boosting army power and this lull is the point Neoline and even Daert may well be mostly caught up on Rage-relevant Skills. Once you do hit your unique Skills, though... Bagyr catapults up to being possibly the best class/character of the bunch, thanks in no small part to there being multiple Rage moves that effectively auto-scale to enemy stack size, letting Bagyr take on shockingly huge battlegroups earlier than Neoline or Daert and still manage to take them out -possibly even without casualties! Dark Side is a buggy, incomplete mess, but I'm glad it exists just for the fact that it's the first game in the series to get the Might class right. +10% to Attack. Additionally, starting from the tenth Might Skill rank purchased, every Might Skill purchased increases maximum Rage by 1, increases the effectiveness of Rage Skills by 1%, and slows Rage loss out of battle by 0.5%. Skill tree requirements: Everything Shield of Rage, Frenzy, and Rage Grasp. I really like how it's a mugshot of an Orc Chieftain-the-unit. Bagyr's face is even loosely similar! Interestingly, the name for it in the files is 'Warboss', like a 40k Ork leader. Note that when maxed this is +34 Rage, and +34% to damage on damaging Rage Skills. (Caveat: Chieftain doesn't boost the damage of Flames of Passion, nor does it affect the percentile component of Orc Strike's damage, only the fixed portion) And I guess also you lose Rage 17% slower, but whatever, it's not like it's increasing your Rage minimum out of battle like Rage Grasp does. This is the first of class/character-locked 'superskills' that strongly define each character/class. Chieftain makes Bagyr king of Rage for all time, even aside the Skills locked behind it, and I really just love the dynamic of the superskills, as they finally give you a real reason to go maxing the low-value Skills in your class' tree. In previous games, it was barely worth eg maxing Meditation as a Mage, even though it was easy to afford, and indeed in Armored Princess it arguably makes more sense to take advantage of the Rune Trader to get more ranks in bigger payoff Skills that aren't in 'your' Skill tree. Dark Side is the first game where there really feels like an ongoing payoff worth chasing for maxing your tree, and it's fantastic. This is doubly important since Dark Side doesn't have a Rune Trader at all. +15% to crit chance when counterattacking, +5 to all resistances, and critical hits caused by unit attacks and Talents have a 33% chance of inflicting Bleeding. +25% to crit chance when counterattacking, +10 to all resistances, and critical hits caused by unit attacks and Talents have a 67% chance of inflicting Bleeding. +40% to crit chance when counterattacking, +15 to all resistances, and critical hits caused by unit attacks and Talents have a 100% chance of inflicting Bleeding. So Bloodlust has turned into an army-focused Skill, and it's a pretty dang awesome one. The crits boost combines naturally with the crits-equals-Bleeding effect, encouraging getting melee stuck in with the enemies to cripple them. And this is all synergistic with the global resistance boost, making Bagyr the first Warrior who actually has it seriously worth considering hurling a melee-heavy army at the enemy, as his units can tank a lot of punishment and will be dishing out awesome damage and Bleeding as their reward for getting into a brawl. I love Bloodlust so much. That said, I'm not sure if the crit chance boost is "40% means 10% becomes 50% on counterattacks" or "40% means 10% becomes 14% on counterattacks". The in-game description seems to imply it's the latter, but Dark Side's translation is erratic in its accuracy and testing this particular point to reasonable certainty would be a huge pain. On the other hand, the next Skill means Bagyr tends to slaughter even endgame armies with Rage so quickly his units barely contribute, so while Bloodlust is really cool you won't necessarily get as much use out of it as you'd expect. Still, it's the best-designed army-focused Might Skill in the entire series, full stop. Using a Rage Skill has a 15% chance of allowing for another use of Rage in the turn. Using a Rage Skill has a 30% chance of allowing for another use of Rage in the turn. Using a Rage Skill has a 45% chance of allowing for another use of Rage in the turn. This is a lower rate than Runic Mastery could achieve, but it's not dependent on keeping 20 Runes unspent, so in real terms it's basically a flat improvement. Especially since it can chain infinitely now. Rage Mastery has the rather interesting impact of making Bagyr place a much higher value on Control upgrades and on maxing Anger and bolstering his Rage max as fast as possible, as he can burn through shocking amounts of Rage insanely quickly, and having his Rage moves on a low cooldown better positions him to take advantage of Rage Mastery chains when he lucks into them. The fact that this graphic is unchanged even though it makes no thematic sense is one of many hints that Dark Side didn't quite achieve all its design goals before release. Which is too bad, because it could've used more polishing, especially the beginning and end of the game. In practice, Rage Mastery is an incredible game-changer, arguably more significant to Bagyr than Chieftain is. My own experience is that the listed 45% activation chance at rank 3 is far below its expected rate of success: in most battles I get 4 or more Rage moves used in the first turn, where a 45% chance should have less than 1 in 8 battles have 4 Rage moves used first turn. This dramatically spikes Bagyr's ability to just dump huge damage on the enemy, reshape the battlefield to better suit him, and in the process boosts his Rage Experience gain rate to a shocking extent, causing him to have far more powerful Rage than the other classes far earlier. Dark Side is thus the only game in the series where the Might class can feasibly use Rage to brutalize fights in the way Mages have always been able to use Spells to achieve. And it even has a certain amount of sanity-checking built in by Dark Side moves trending increasingly toward fairly high Rest periods. As such, while Bagyr can dump astonishing amounts of damage in the first couple of turns via Rage, any army large enough that his forces can't mop up what's left at that point is an army he does actually have to deal with using his own army, as opposed to continuing to spam Rage like crazy. It's a really well-designed mechanic! 10% chance for Rage attacks, unit attacks, and unit attacking Talents to do doubled damage. 20% chance for Rage attacks, unit attacks, and unit attacking Talents to do doubled damage. 30% chance for Rage attacks, unit attacks, and unit attacking Talents to do doubled damage. So remember how Warriors of the North's Berserker was a small chance of double damage on unit attacks? Yeah, let's just double the chance of it occurring and make it apply to Rage, too. Blood Rage is never something to be counted on, but it makes Bagyr's armies and Rage skills on average considerably more lethal than Neoline and Daert's own, and its odds are high enough it's actually something that will happen pretty routinely once you've maxed it, you just can't count on it for any specific occurrence. Especially since, just like Berserker in Warriors of the North, it actually rolls per hit rather than being binary for the attack as a whole: Blood Rage is thus actually a fairly reliable boost to Orc Shield (A minimum of 5 targets means it'll average 2-ish triggers of Blood Rage per use on regular/small battlegroups), and once you've upgraded their strike zones so too Black Hole, Necro Pack and Orcish Rage, as you'll often be hitting 5-10 targets at once. With that many rolls, there'll usually be one or more successes each usage. Do note that Blood Rage can trigger on friendly-fire hits. This isn't a huge thing, since crit-Bleeding already means friendly fire is almost always unnecessarily risky, but it's worth knowing. Next time, we of course move on to Dark Side's approach to Spirit Skills and talking about Neoline the Demoness.